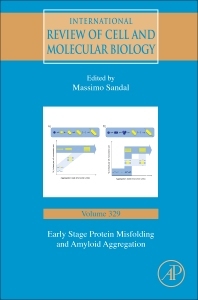 Early Stage Protein Misfolding and Amyloid Aggregation, Volume 329, the latest in the International Review of Cell and Molecular Biology series presents comprehensive reviews and current advances in cell and molecular biology, including articles that address the structure and control of gene expression, nucleocytoplasmic interactions, control of cell development and differentiation, and cell transformation and growth. The series has a worldwide readership and maintains a high standard by publishing invited articles on important and timely topics as authored by prominent cell and molecular biologists. MMassimo Sandal received his doctorate qualification from the University of Bologna in 2008 for his research on active conformers of proteins. He has gone on to conduct research on proteins in departements of Biochemistry and Biotechnology across Europe. Following on from the University of Bologna, he was a post-doctoral FEBS Fellow at the University of Cambridge and a post-doctoral associate at the University of Verona in 2012. From 2013 to 2016 he was associated to the German Research School for Simulation Sciences in Jülich, Germany.